Many people wrongly view a traffic ticket as just a simple annoyance or minor irritation that can be forgotten as soon as it’s paid. But the truth is much more complex. 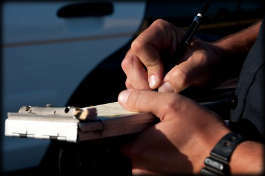 A moving violation traffic ticket can result in lasting damage to your driving record which may bring cancellation of your auto insurance or sharply higher insurance premiums. Even minor offenses, if repeated within a short timeframe, could bring you fines, suspension of your driver’s license, or even imprisonment. Whether a licensing, registration or insurance infraction, a speeding ticket or other operating violation, a Muskogee County DUI, a DWI arrest or any other traffic-related charge, you deserve a vigorous defense by a Muskogee traffic offenses attorney who knows the law and the courts. A skilled criminal defense lawyer in Muskogee will help you assert your rights and defend your interests in traffic court. As a matter of public record, it can also damage your reputation, ability to work and job prospects. Admitting guilt to a traffic offense by paying the ticket also means you may face increased penalties for any future offense. If you are facing a traffic offense in Oklahoma, you should consult with the traffic offenses attorneys at the Wirth Law Office in Muskogee. For a consultation with an experienced Muskogee traffic offenses attorney in the Wirth Law Office, call today at (918) 913-0725, or call toll-free at 1-(888) 447-7262 (Wirth Law). The skilled Muskogee criminal defense attorneys offense lawyers at the Wirth Law Offices can represent in-state and out-of-state drivers on Oklahoma roads. They will use their expertise to help you defend your interests and help you fight improper charges. Even with the best of intentions, law enforcement officers may not observe legal requirements or fail to follow proper procedures. Even an everyday occurrence like ticket for a motorist caught in a speed trap may raise issues that an experienced traffic offenses attorney can assert on your behalf. For example, the radar or other speed detection equipment may not have been properly calibrated, or its operator adequately trained, or the locality may not have complied with other state legal requirements. Of course you should always obey posted speed limits and drive safely, but not every speeding ticket is deserved or fine justified. When you need help, look for an expert who will be on your side. The experienced Muskogee traffic offenses lawyers at the Wirth Law Office can work for you in preliminary stages for favorable outcomes, like winning dismissal or reduction of charges or penalties. If the need arises, a defense attorney in Muskogee can defend you in hearings and court appearances. An attorney with courtroom experience can negotiate or argue for acquittal, dropped charges or deferred judgments. Under deferred judgements – often available to defendants represented by an attorney – the record can later be expunged if no further charges are filed against you for a period of years. To protect your record and your driver’s license, if you are facing a traffic charge, call an experienced Muskogee traffic offenses attorney today at (918) 913-0725, or toll-free at 1 (888) 447-7262 (Wirth Law). If you prefer, you can use the box in the upper right-hand corner of this page to send a brief question or message.